Italian - Borragine Borage is an old fashioned plant which was originally native to the Mediterranean region but has been introduced to many other areas and grows satisfactorily in gardens in most climates. It is self seeding and grows completely wild all over Italy. Borage grows to a height of between 60cm and 100cm. The simple leaves are between 5cm and 15cm and are alternate. The flowers have 5 petals and resemble a star (hence the name Star Flower) and always hang downwards. Although there is a white variety the vivid blue is dominant and therefore more prolific. It was originally grown for eating and medicinal purposes with the leaves being used as a garnish, in soups, broths and stews, to make tea and as part of a mixed leaf salad. The flower is also edible but is usually used as decoration either on salads or candied on cakes. The leaves of the borage herb have a cucumber flavour whilst the flowers have a mild, sweet taste similar to honey. Traditionally, borage was used to treat a variety of ailments, particularly as an anti-inflammatory, to increase breast milk production and to treat bronchitis and colds. Today it is rarely used but instead the oil is extacted from the seeds on a commercial level. It is used to treat ailments such as rheumatoid arthritis, premenstrual syndrome, diabetes and to help in the prevention of heart disease and strokes. The oil has also been used to treat some skin disorders but it's efficiency is limited and unproven. 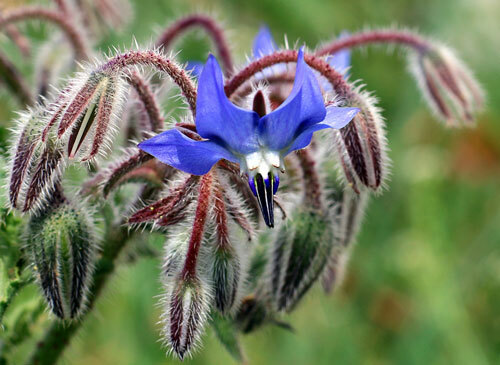 Borage flower and leaves are sometimes still used for helping fevers, coughs, bronchitis and depression. The oil from the seeds is also used commercially in skin care products. To the garderner, borage is an invaluable companion plant and one of the best to grow among vegetables and fruit. It attracts both bees and butterflies which increases pollination which in turn helps to produce a larger crop. It is particularly good to grow it with strawberries and tomatoes, helping the former to produce a higher yield of fruit and the latter by deterring the moths of tomato hornworms and preventing them from laying eggs. The plant has an ancient history in war as an enhancement for bravery and courage. 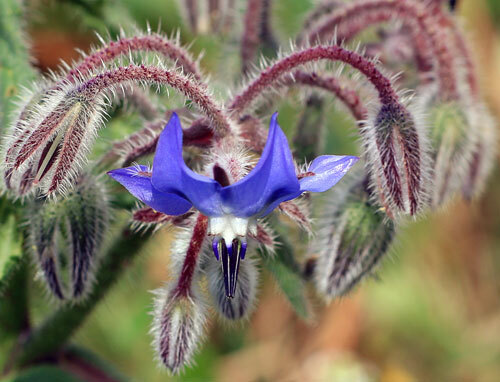 Pliny the Elder said that borage was the 'Nepenthe' mentioned by Homer, which caused forgetfullness when mixed with wine. In the northern Italian region of Liguria, borage is commonly used as part of the filling for ravioli. Once it was traditionally used in Pimms Cocktail but nowadays has been replaced by slices of cucumber. Borage flowers are often used in potpourris. Borage flowers can also be candied and used for stunning decorations on cakes.